Compared with similar five-year measures from 2000 and 2010, immigration of Mexicans to the U.S. is markedly below its peak in 2000. Between 1995 and 2000, close to 3 million Mexican-born immigrants left for the U.S.; between 2005 and 2010, that number decreased by about half, to about 1.4 million; and between 2009 and 2014 the number of Mexican immigrants heading to the U.S. was about 870,000. 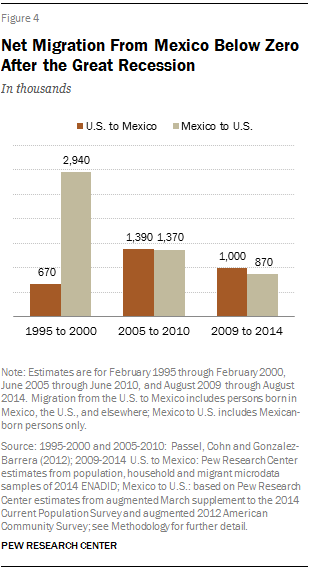 Going the other way, about 1 million people left the U.S. for Mexico between 2009 and 2014. This is a lower number than between 2005 and 2010, when return migration reached close to 1.4 million, but it is significantly higher than a decade earlier; it is also higher than the number of Mexican nationals coming to the U.S. Among the 1 million migrants returning to Mexico from the U.S., there were 720,000 who had been residing in the U.S. in 2009 and were living in Mexico in 2014. An additional 180,000 were recent migrants who were living in Mexico in 2009 but left for the U.S. and came back to Mexico between 2009 and 2014. And an additional 100,000 were children under the age of 5 who had been born in the U.S. and were living in Mexico in 2014. As the flow of new immigrants slows and the number of returnees remains high, the net flow from Mexico to the U.S. is now negative, though both flows are smaller than they were five years ago. The negative immigration flow from Mexico to the U.S. also is reflected in the number of Mexican immigrants currently residing in the U.S. with and without authorization, which has continued to drop since reaching its peak in 2007 – from 12.8 million to 11.7 million in 2014. 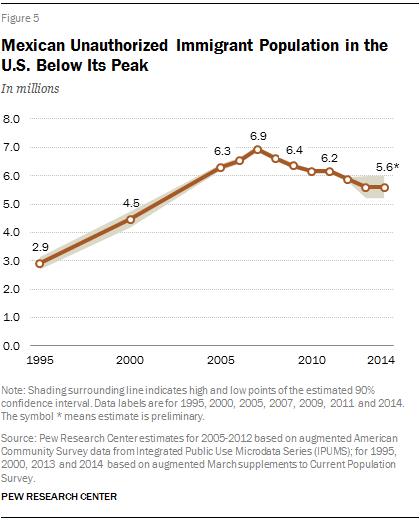 The Mexican unauthorized immigrant population has continued to decline since reaching a peak of 6.9 million in 2007. Preliminary estimates from the Pew Research Center show that in 2014 there were about 5.6 million Mexican immigrants residing in the U.S. without authorization. This reflects a drop of about more than 1 million from 2007. The drop in the number of unauthorized Mexican immigrants residing in the U.S. partly reflects tougher enforcement at the southwest border. In fiscal 2013, deportations of Mexican immigrants reached a record high of nearly 315,000, an increase of 86% since 2005, when a policy shift made it more likely that Mexican border crossers would get deported, be barred from legal re-entry for a number of years and risk criminal prosecution if entering illegally again in the future, instead of simply returned to Mexico with no consequences attached (Rosenblum and Meissner, 2014). The smaller number of unauthorized Mexican immigrants may also reflect a reduction in the number of Mexicans attempting to enter the country illegally through the southwest border. In fiscal 2014, the number of Mexican immigrants apprehended at the southwest border of the U.S. dropped to about 227,000, a level of apprehensions not seen since the early 1970s (Krogstad and Passel, 2014). In contrast, the number of apprehensions of non-Mexican immigrants, mostly from Central America, reached a peak at close to 253,000. This was the first time on record that Border Patrol apprehended more non-Mexican immigrants than Mexican immigrants at the southwest border. Although the number of unauthorized immigrants from Mexico has been declining, they still amount to about half of the total U.S. unauthorized immigrant population. Today, unauthorized Mexican immigrants make up a lower share (48%) of the Mexican-born population living in the U.S. compared with their peak in 2007 (54%). From 2009 to 2014, 1 million Mexicans and their families (including U.S.-born children) left the U.S. to move to Mexico, according to data from the 2014 Mexican National Survey of Demographic Dynamics (ENADID). Lack of work in the U.S. was a more important reason for the 180,000 return migrants who lived in Mexico in 2009, left for the U.S. after that, and came back to Mexico between 2009 and 2014. One-quarter (25%) of more recent returnees said the main reason they came back was they had not been able to find a job, while 40% said the main reason was to reunite with family. Chapter 3: Mexicans Report Fewer Connections in the U.S.